Car parking is one of those hot button issues in planning that the community and politicians get most excited about. Peter Phibbs unpacks the parking issues in the recent proposed SEPP 65 changes which allow developments close to stations to have no parking for their residential units. The recent announcement by the Minister of Planning, that there may be no minimum requirements for some LGAs for developments within 400 metres of train stations under SEPP 65 changes really got the commentariat going. Probably the most sensational was an article in the Daily Telegraph Liberal MPs smash Pru Goward for joining Clover Moore’s car-killing crusade. What ws the proposed change? SEPP65 is a State Environmental Planning Policy the aim of which is to improve the design of apartment buildings. It provides some design guidelines and also a set of standards which council must use when assessing development applications for apartment buildings. In the most recent modifications to the SEPP it has also attempted to have an impact on affordability by not allowing councils to use the lack of parking as a reason to either refuse a development application or to modify a development application in the situation when the apartment site has good access to public transport. Note that this does not mean that the State Government now requires developers to have no parking. It simply says if a developer does take that option the council cannot refuse the application based on this issue. SEPP 65 has other guidelines on things like apartment sizes. And please note – the option about car parking is not operational yet. The idea was put on exhibition until the end of October 2014 and public comment was invited. So is the world going to end? Will it suddenly be much harder to find a park. Will someone steal that spot out the front of your house which is “your spot”? Well let me first explain what is likely to happen. 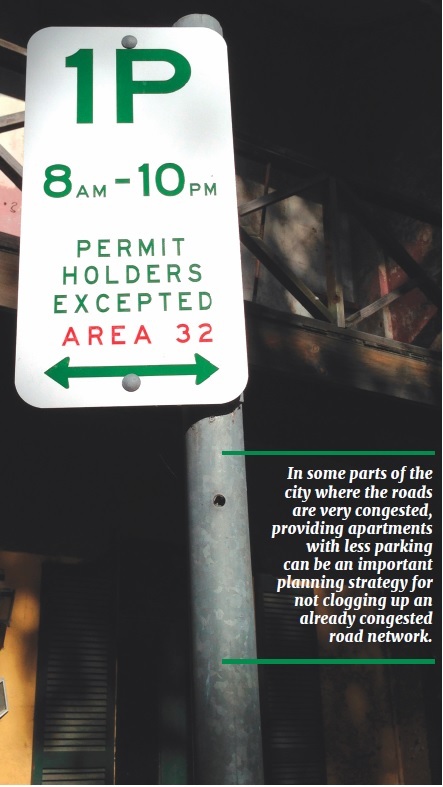 In many council areas, where there is no maximum parking requirement, things probably won’t change much. If developers think that providing an apartment without a car space will not sell in their proposed development, they will proceed as before and build apartments with car parking. So the planning change allows for less car parking but does not require it. The decision is left up “to the market” – what the developer thinks will sell. In inner city areas where there is good public transport there are already a lot of apartment dwellers without cars. For lots of reasons these owners or renters get around using alternative means such as public transport, bicycles and car share (like Go Get). For these people the costs of owning and running a car don’t add up. In a range of centres, there are very large numbers of apartment dwellers without cars. This means that there is less traffic on the streets, less greenhouse gases, less oil consumed – all good things. The proposed changes in the planning system allow this group to be catered for. In some parts of the city where the roads are very congested, providing apartments with less parking can be an important planning strategy for not clogging up an already congested road network. Will this make housing really affordable? The cost of a parking space for a new apartment where the parking has to be provided underground can be up to $75,000, so it is likely that apartments without car parking will be cheaper. However, it is unlikely that the full savings will be passed onto the purchaser. One of the great myths about development is that developers price dwellings at their total costs plus a profit margin so anything you do to costs always appears in the sale price. Developers price their apartments depending on what the market will bear – don’t forget that the new market represents only a small percentage of the total housing supply (1-2%). The price tends to be set by the established market. Not surprisingly, the resale value of an apartment with car parking tends to be more than equivalent apartments without car parking. People looking in the market describe the difference is in the order of $35,000-40,000 – so the saving could be in that order. It will be more in higher value areas, especially in areas – think Bondi – where apartments with car spaces are in short supply. Once there are a larger number of apartment blocks – some with apartments with car parking and some without – it will be easier to get a more precise measure of this price difference. Isn’t it everyone’s right to own a car and a car space? Well, actually no. What is probably more important is that we develop a housing market that provides choice so we can allow people to seek the combination of housing/parking/location that maximises their own wellbeing. Whilst lots of people might think that not having your own car/car space would be like cutting off your arm, for many younger people, the whole car/car space thing is so last century/analog/boring. One way to see this is to examine the statistics on driving licenses. Back in the day, kids used to apply for their license the very first day they were eligible. Now many younger people put that off until they are well into their twenties. On the other side of the age distribution, many older people will lose their licenses because of disability issues – for them the car/car space package will also make no sense. Overall, I would see this change as positive in the parts of Sydney where there is good public transport. However, like all changes there will be some implementation problems. Firstly, the policy will work best where occupants of the apartments aren’t given an on-street parking sticker in areas with a shortage of parking spaces (though obviously there would be exceptions to this rule such as for people with a disability). The other issue is that renters may end up signing on a lease on the basis of advice that they can obtain an on-street parking permit (now who might tell them that?). In this case, there should be a longer cooling off period so tenants can be released from a lease in these circumstances. Councils should also provide better on-line information and maps to highlight where resident car parking permits are available and the areas where resident car parking spaces are not available. And for it to really work we need to improve our public transport alternatives such as greater services across the radials in inner city areas. Professor Peter Phibbs is an economist/planner and is the Chair of Urban and Regional Planning and Policy at the Faculty of Architecture, Design and Planning at the University of Sydney.